Author Tony HirstPosted on November 3, 2017 November 3, 2017 Categories Admin...1 Comment on Six Degrees of Separation May Work in the Real World, But Not Inside a Siloed Organisation? Note to self around working with ssh. If you create your own keys, eg named id_reclaim set originally via ssh-keygen -t rsa -C me@mydomain.com, and share the key with the site you want to login to (eg.g user@wherever.com), you can specify that particular key for use in a login to the site using ssh -i id_reclaim user@wherever.com. My case for promotion is based around excellence in teaching and scholarship, with a strong theme of digital scholarship and community engagement. I have chaired three courses (production and presentation), and authored on four others, pushing the elearning agenda through technology and design innovation with a view to reuse. In 2000, I developed two units for T396 delivered via a novel electronic study guide, providing a unified browser-based interface to online, offline and CD-ROM content, and a mobile website for course alerts. This work identified issues relating to authoring content specifically for browser based delivery on desktop and mobile devices that have informed my work ever since. A major feature of my approach to the production of teaching materials relates to supporting reuse in other contexts. Whilst writing online material for the T184 robotics course, I commissioned several interactive browser-based activities that have been reused on courses such as TXR174, as well as for outreach. Using T184 software, I developed a range of activities for schools and OU regional Aim Higher/Widening Participation initiatives. These were delivered at over 50 events by the OU Robotics Outreach Group (which I co-founded 1 and whose members produced over 20 formal publications during the period 2000-2007, as well as press coverage). In turn, the activities informed the course material design for the TXR174 residential school robotics activity as a series of worksheets, some of which were consequently reused verbatim on T885. Interactives I developed for TU120 have also been used in wider reaching Library training activities. As chair of T184, contributor to TU120, I used Google Analytics for discovering how students used online course and Library materials. This led, in part, to the OU Library website adopting and using Google Analytics for tracking Key Performance Indicators. 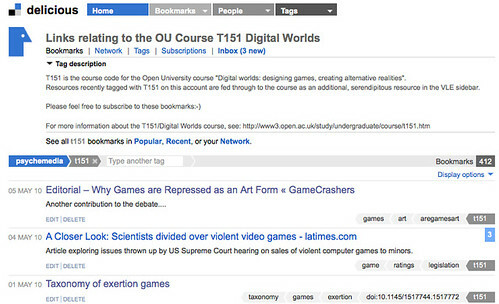 In both T184 and TU120, I lobbied for the used of embedded third party content from Youtube and flickr within course materials, working with the OU Rights Department to clarify issues around the use of such content, making it easier for other course teams to draw on similar resources in the future. For T151 Digital Worlds, I created a flexible and adaptable curriculum of the sort that IET are now exploring using a structure that also informed the development of T123. An innovative custom search engine capable of searching over all and only the public web-based resources linked to from the T151 course materials led to a similar service being adopted in TT381; T151 also used an interactive mindmap (now being explored by LTS) to provide at-a-glance views over the whole course on one screen. 1 As member of the OU-ROG I helped organise a Blue Peter “Design a Robot’ Competition (>20, 000 entries); a national junk modeling event (sponsored by 20th Century Fox, funding I secured); the launch of an OU badged hobbiest robotics range sold via high street retailers; convened three conference workshops on artificial intelligence and robotics at UK based international conferences, as well as RoboFesta-UK, a series of five annual meetings attended by between 50 and 100 members of the UK robotics education community each year; I was PI for the EPSRC funded Creative Robotics Research Network (rated tending to outstanding). Throughout my career I have explored new methods of digital scholarship and ways of using technology to transform research, dissemination and knowledge construction, developing an international reputation as an advocate of emerging web technologies through community engagement. Google Suggest (results based in part on frequency of searches around particular search terms) shows my name is strongly associated with The Open University. The line chart shows page views (excluding RSS subscription views) on the OUseful.info blog. The heart of my scholarly activity is the OUseful.info blog, started in 2005. Since July 2007, it has grown to attract >2000 regular subscribers, c. 1000 views per day, contains over 500 posts (the most notable attracting over 20,000 views each), and has received over 1500 comments; over the last 12 months, there have been c 20,000 clicks through to external sites, including over 4,000 to a single site (Adobe Flash Privacy settings). Nominated for the 2008 Edublog awards, it is regularly listed in the top 30 UK technology blogs (wikio) and currently has Technorati rating of 426. Research conducted for Online Services ranked it as the 10th most influential site for ‘distance learning’ (above the BBC) and 2nd as a hub for connections around this term 2. I have an active Twitter presence (>2400 curated followers, >5000 click-throughs on shared links per month (bit.ly), >100 unique retweeters (klout)). With an archive of presentations on Slideshare dating back to 2006, my top three presentations have drawn over 20,000 views between them and the twenty presentations posted so far this year have attracted >9000 views. I am established as a prominent member of the global edu-blogger community, receiving a large number of online citations and credits, and many speaker invitations. As a prominent OU blogger, my work is used as a model for the development of digital scholarship within the University. Reflecting evolving notions of digital scholarship, my reputation spans several disciplines, as evidenced by a public call I put out for feedback on the impact and influence I have had on others 3. 3 The web based form attracted 26 submissions (24 legitimate) and provides strong anecdotal and personally communicated evidence for the claims that follow. I am happy to provide access to the responses on request. Since publishing the first MPs’ Travel Expenses Map visualisation in 2009, I have developed a strong reputation in the data journalism area at an international level: my blog posts are used to demonstrate good practice by several industry websites (e.g. journalism.co.uk), my work is being shared in several different UK universities and referenced widely in others’ conference presentations (e.g. regularly by Simon Rogers, Guardian Datastore Editor); I have received several invitations to present at journalism events. Building on the open source WriteToReply document discussion platform I co-founded in 2009 (as mentioned in the national press (BBC, Guardian)), I helped win JISC Rapid Innovation funding and further exploitation funding for JISCPress. JISCPress has been used to publish JISC Strategy documents and reports, and is currently being discussed as a potential tool for publishing commentable internal OU documents. WriteToReply has been used by several government departments (including DCMS, The Cabinet Office, ONS) to republish consultation and guidance documents in commentable form. WriteToReply has contributed to the development and adoption of “commentable documents” as a consultation strategy type within UK government and, via JISCPress, benefited from an accessibility review commissioned by the Department of Innovation Business and Skills. In 2007, I brought together an informal team to develop an OU Facebook application, devising and leading the development of the OU Course Profiles application (> 6,000 users soon after it launched), following it up with a peer support application: My OU Story. To date, these remain the OU’s only Facebook applications, although more are now planned with VC support. My approach towards rapid prototyping has resulted in numerous invitations to run practical workshops, as well as being referenced in several JISC funding calls. The “technology recipes” I publish have been widely adopted and reused by individuals within institutional contexts in the UK and internationally, both for service delivery (e.g. the use of RSS feeds and Yahoo Pipes for content syndication and information processing) as well as teaching (e.g. relating to the use of social technologies in both postgraduate and undergraduate courses). I have advocated the use of interactive web technologies using lightweight approaches in support of OU/BBC broadcasts: in my role as OU academic supporting the BBC World Service’s Digital Planet, I set precedents in the use of embedded, user generated content from third party services, such as YouTube and flickr within programme support pages, and commissioned the development of an interactive map for listeners that allowed them to show where they were listening to the programme (to date, over 1100 listeners have done so). 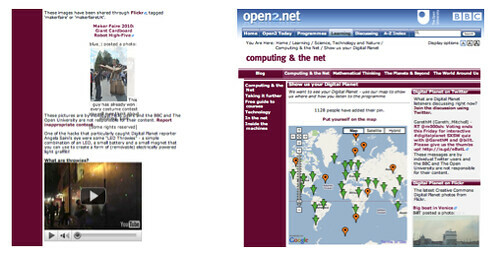 Examples of content embedding on open2.net. Following my Arcadia Fellowship with the Cambridge University Library (“the UL”), several of the recommendations I made fed directly into the UL’s latest round of strategic planning. Outcomes from my Fellowship also fed in to two future service delivery workshops I ran for the OU Library. My approach towards “openness” is based on a deep belief in the idea of community engagement, and the role of the academic in supporting communities around them. My social networking activities provide an element of extended support to a wide ranging community, not dissimilar to the support provided as part of a PhD supervision process. My willingness to share ideas means others are free to develop them. The iTitle and uTitle social media caption tools developed by JISC Regional Support Centre’s Martin Hawksey, and that have been used to annotate several conference video archives with backchannel commentary, are a direct result of ideas posted to OUseful.info. A couple of weeks ago I did a phone interview for the OU’s DISCO project – OU Digital Scholarship Portal. From what I remember of the call, it rambled over many and varied topics, including possible metrics that might be taken into account when putting together promotion cases that include a demonstration of excellence in digital scholarship (whatever that is…). If I’m going into the archive, someone else can put me there… But for the promotion case, acknowledgements are the lowest of the low in terms of academic credibility, rivaled only by (pers comm). Which is a shame – because one of the quotes I carry with me (but unfortunately can’t credit because I can’t for the life of me remember who said it, except that it was someone from outside the OU giving a seminar in the OU), that the whole point of being an academic is to have interesting conversations. Anyway, the reason why I started to write this post is this: if the digital scholarship folks want metrics around how effective a scholar’s online activities are, it may be worth looking at tangible outcomes in the real world – such as invitations (e.g. to speak at seminars and workshops) and acknowledgements (e.g. in books, articles and reports). This conversion from informal online activity to a formal request in physical space is where the “citation” is evidenced. By sharing my work freely, people around the world are able to see it, and they willingly pay for me to come and speak to them. I do not collect speaker fees, but I do require that they pay my expenses, because otherwise I could not afford to travel to their cities. We both benefit, because I then use these trips to produce work that we share with other people around the world, and the cycle continues. If the point of publishing is to communicate ideas, then presentations count. And if the refereeing process is to guarantee quality, then being given an invitation to speak also reflects reputation brownie points and an element of trust on the part of the person responsible for extending the invitation, even if they are not explicitly evaluating the actual content of a presentation a priori. As to the benefits accruing to Stephen’s employer: “[t]hey get the reputation from sponsoring my work” as well as influencing whatever he is working on. 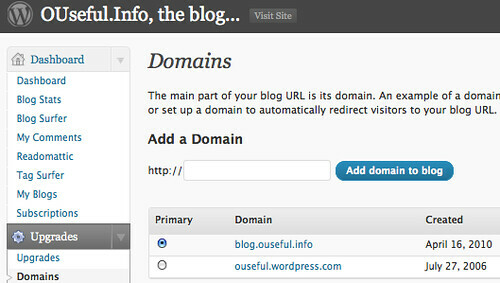 The eagle eyed among you may have noticed a change to the domain part of the OUSeful.info URL. I took the plunge, and paid for a WordPress upgrade, and now I have a OUseful.info subdomain – http://blog.ouseful.info – acting as home to the OUseful.info blog. The mapping is achieved by adding a CNAME mapping to the DNS settings for ouseful.info so that blog.ouseful.info maps onto ouseful.wordpress.com. (This is achieved via the DNS administration control panel provided by my host). WordPress describe the process here: Domain Mapping » Map a Subdomain. The WordPress Primary Domain setting then determines which domain appears as the default in the browser address bar. And what I suppose I need to do next on the feed subscription front is find a way of taking ownership of http://feeds.feedburner.com/ouseful so that folk can subscribe to that feed (with its attendant statistics) through the address feed.ouseful.info…. Anyone know if this is possible?